Since the late 1980's when I began making puppets, most of my puppetry projects have centered around creating my own live puppet shows and a cast of original character. 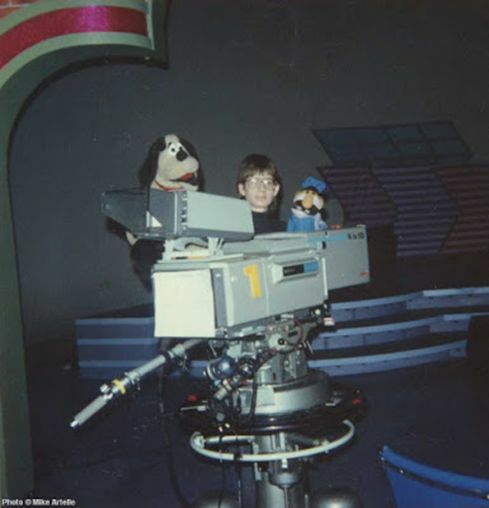 However on occasion I have also contributed as a puppeteer on productions for a variety of clients. Below is a chronological list of these projects. 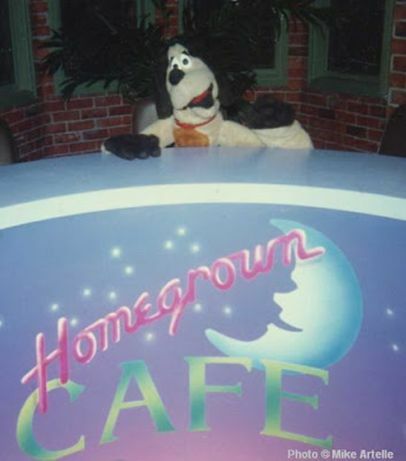 Homegrown Café: During my high school years in the late 1980s I performed my puppet character Bruno the Dog (above) on the first season of "Homegrown Café" on CJOH (CTV). 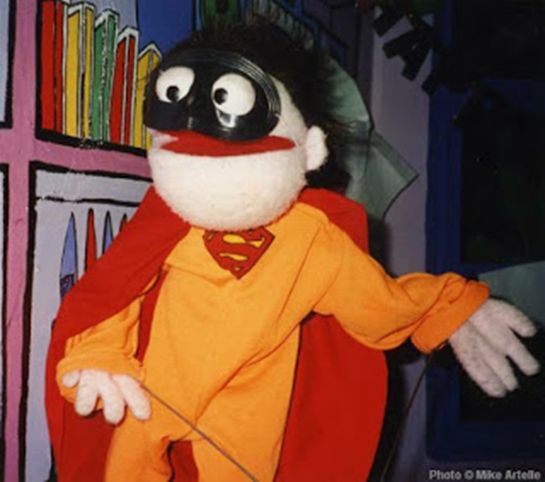 This was the first time that I performed a puppet on television! "Homegrown Café" was a variety show that showcased local talent. Each show had judges to pick the winning skits, but in truth they were tasked with comparing apples with oranges. Unfortunately I lost to a baton twirler who set the ends of her baton on fire. So of course the joke there... next time I should light my puppets on fire! The above photo shows Bruno the Dog sitting at the judges table. 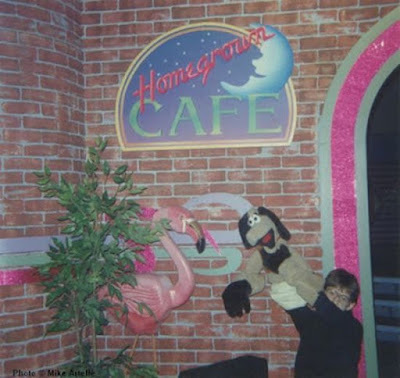 Here I am at 15 or 16 years of age with Bruno and Mr. Noodlehead in the "Homegrown Café" studio at CJOH. The building that this studio was in has since been torn down. It was located next to the radio station at the corner of Clyde Ave. and Merivale Rd. in Ottawa. Below, Bruno meets one of the flamingo set pieces. 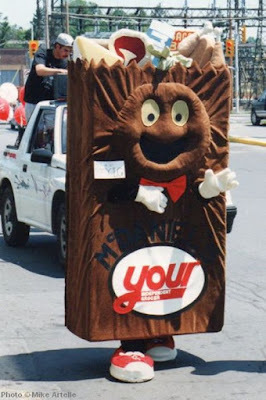 McYIG Mascot Costume: From the early to mid 1990's I worked at the Westgate Mall Your Independent Grocer store packing groceries and doing car orders. During this time I built a mascot for the store named McYIG. He was a giant smiling paper bag filled with groceries. This photo was taken during his unveiling which was promoted as being his first birthday party! There were balloons, cake, and face painting. I wore the costume for the "big reveal" and had to walk outdoors from the back of the mall to the front of the store where the party was. Some staff followed behind McYIG in a jeep playing the Rocky theme song. Unfortunately it was a windy day and the whole costume acted like a giant sale. I almost blew over several times! One of the staff walked next to me to catch me just in case I started to tip over. The Rocky theme song ended up being all to appropriate for the occasion as I struggled to walk against the wind in that thing! It all worked out though and kids really liked McYIG. 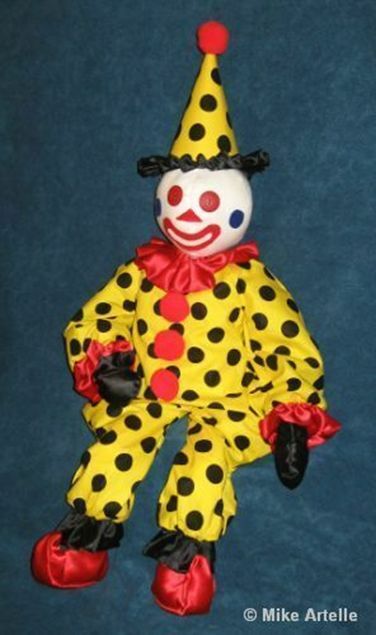 Over the next few years I had fun wearing the costume on several occasions, during which many people took a picture of him with their kids. Kiddie Corner: In the mid 1990's, shortly after creating my Jack and the Beanstalk live puppet show, Jeremy (who played the role of Jack) became my first puppet TV star when students in the Television Broadcasting course at Algonquin College asked me to do some puppetry for them. At first they weren't sure what type of puppet they wanted, so after looking at a few of my puppets they chose Jeremy to become their star. It was destiny! He went on to appear in six episodes of "Kiddie Corner" which aired on the local community access TV station several times. On the program, Jeremy became Shopkeeper Sam's assistant in the corner store where all the friendly neighbourhood characters interacted. In one episode Jeremy wore a superhero costume, transforming into.... Super Jeremy! 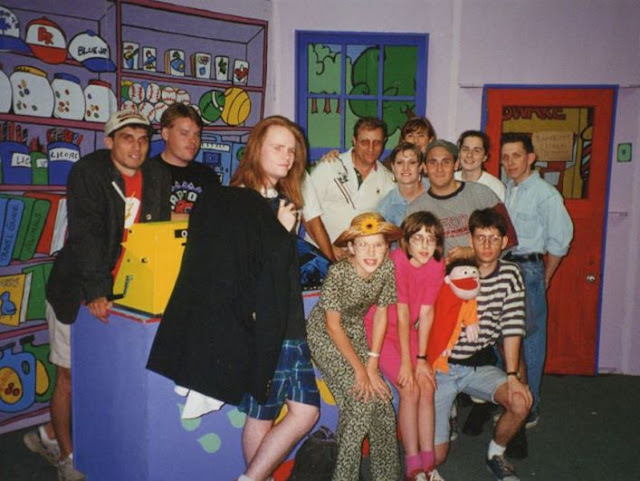 Most of the cast and crew for "Kiddie Corner". Toque, "Eight Seconds" music video: In the late 1990's another group of students from the TV broadcasting course contacted me about doing a music video for a local band. 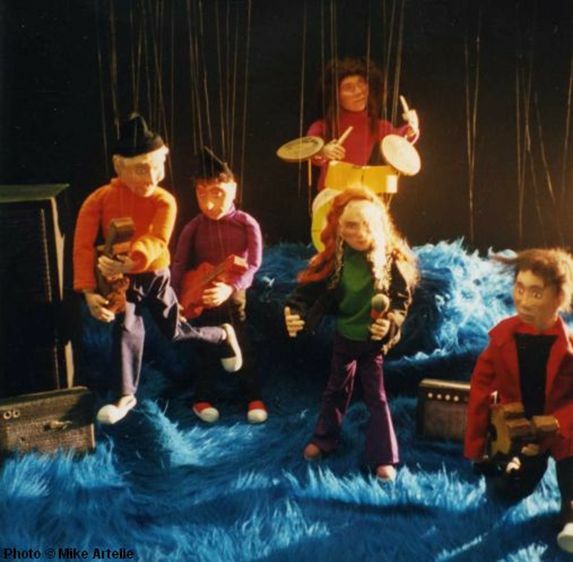 Rather than mouth puppets, they wanted to use marionettes in the video so I ended up making puppets of each of the band members. I had never made marionettes before, and they needed all six puppets finished in one week, so it was quite a challenge! 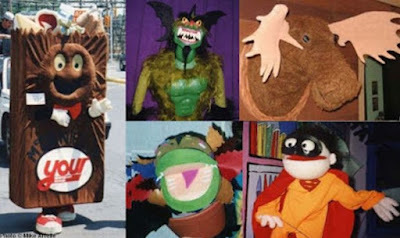 All things considered the puppets didn't turn out that badly, but they weren't jointed very well at all which made the movement awful. Fortunately, the director wanted the "bad puppetry" look for this project, so the crudely jointed marionettes worked out perfectly! The video was for the band "Toque", which had just completed their first CD. 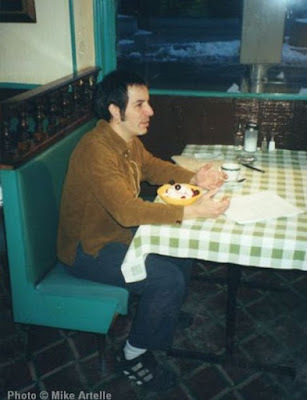 The song in the video was "Eight Seconds". 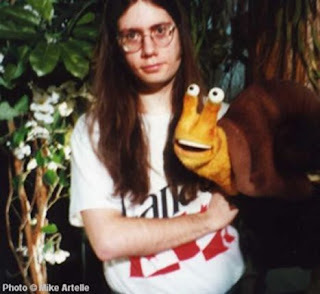 Since the band was called Toque, they wanted some of the puppets to be wearing toques. My mother, who painted the faces of the puppets, came up with a brilliant idea and made their toques using the toe end of a pair of socks! This is Vul-Gar the Ogre, one of the puppets that I made for the Toque music video project. The director asked me to make a monster and said that I could do whatever I wanted with the design, as long as the monster was scary. By this time I was in my mid 20's and very interested in drawing medieval fantasy characters and weird creatures. A few days prior to being told that a monster puppet was needed, I had drawn a picture of a really nasty looking monster which had appeared to me in a dream! I though the monster in my dream looked really cool so I drew a picture of it as soon as I woke up. This became the design for the marionette, which I named Vul-Gar. 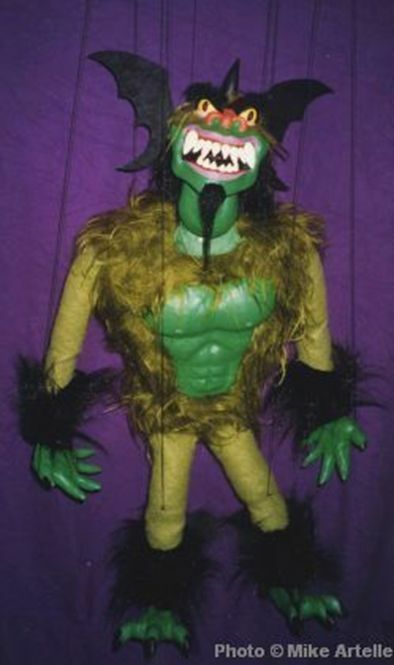 I absolutely love this puppet and have kept Vul-Gar on display in my house ever since, alas, minus his strings. Many years later in 2006 I made a second version of Vul-Gar (shown on the "Hand Puppet Heroes" page of this blog), this time as a rod puppet rather than a marionette, for a medieval fantasy show. This is when I realized that he was meant to be an Ogre, so he became Vul-Gar the Ogre! Most of the music video was shot against a blue screen to allow for footage of a mountain to be added in behind the puppets. 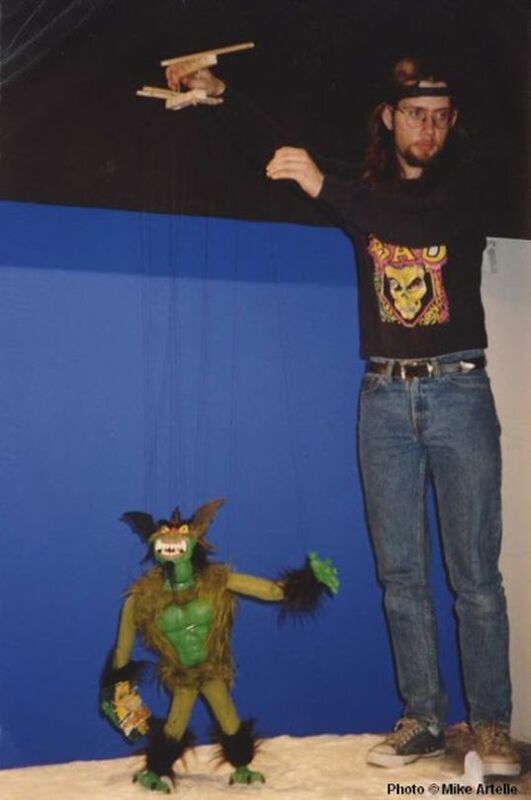 This photo shows Vul-Gar the Ogre's big moment on camera, while I operate the puppet. Sock N Buskin Theatre: Little Shop of Horrors In March of 1999 I got the opportunity to build and perform the puppets for "Little Shop of Horrors", which I had wanted to do for some time. It turned out to be a very enjoyable project. This was for the production by Sock N' Buskin Theatre at Carleton University. They had a very talented group there and managed to have a cast of 40 in the show in addition to a live band, choreographer, and music director, along with all the scenery changes and costumes. It was quite a remarkable production. During the show, the Audrey II flytrap plant grows from a small plant into a giant one. To get that effect the play requires four different sized puppets of Audrey II. I made the first three sizes on my own and refurbished the giant sized plant that was donated by Orpheus Musical Theatre, which had previously mounted a production of LSOH in 1994. 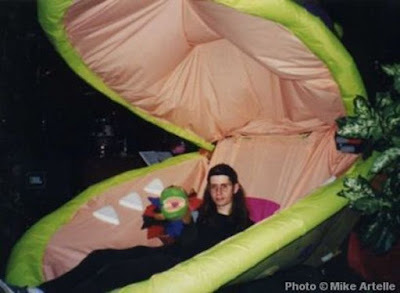 In the above photo I'm lying inside the giant Audrey II puppet while holding the smallest version of Audrey II. There were two more puppets in different sizes in between these, one was a larger mouth puppet and one was a costume that I wore. 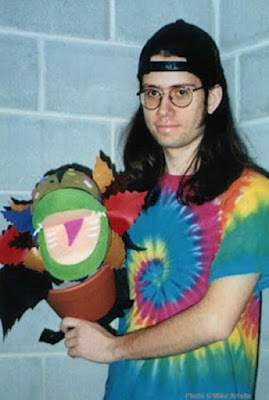 The voice of Audrey II was performed by a very talented singer, also named Mike, who did a remarkable job. It's a shame that the musical score from this show wasn't recorded, it was very professionally done. I did record a video of the show for myself, so eventually I'll post a short clip. 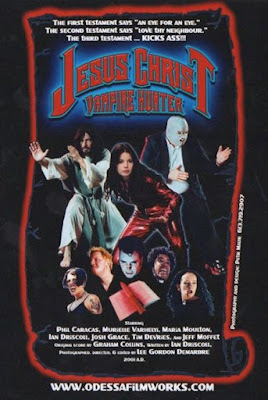 Jesus Christ Vampire Hunter: In 2000 I made and performed a puppet for the Lee Demarbre film "Jesus Christ Vampire Hunter". 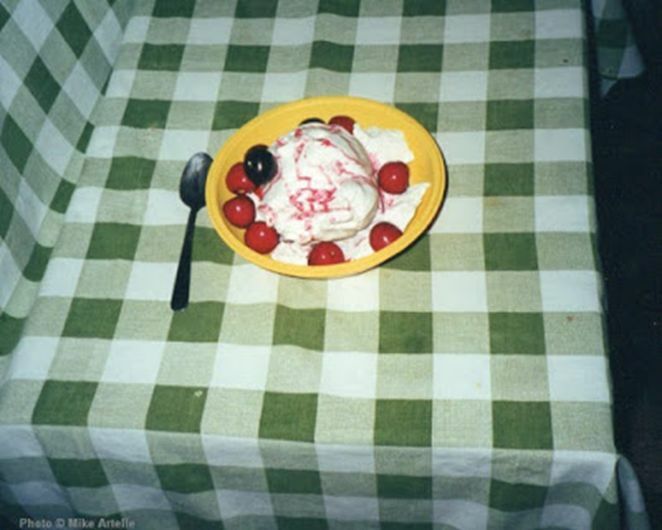 In the movie God appears to Jesus as a bowl of cherries jubilee ice cream with cherries for eyes. I took the above photo during production while Lee was discussing the scene with actor Phil Caracas (Jesus) before the scene was shot. Lee had asked me to make both a puppet and prop version of the bowl of ice cream. I searched the entire city for fake cherries and was very lucky to find some. In the above photo the prop version of "God" is seen on the table in front of "Jesus". The entire scene was shot this way with the prop, then a hole was cut in the table cloth and it was draped over a cardboard box which also had a hole cut in it. Then I put the puppet sleeve through the hole and operated the puppet's mouth for the close up shot, seen below. Later on when the movie was edited, a voice actor dubbed in the puppet's dialogue and the two shots were edited together as one scene making it look like Jesus was talking to the puppet. I still have both the prop and puppet of God from JCVH, and Lee also gave me the green checkered table cloth. Canadian Museum of Nature: In 2006, while I was a student in the Applied Museum Studies program I did a co-op placement at the Canadian Museum of Nature. I was asked to build three puppets for the museum to be used for an upcoming educational program for kids. One of the puppets was a baby polar bear, which I'm constructing in this photo. 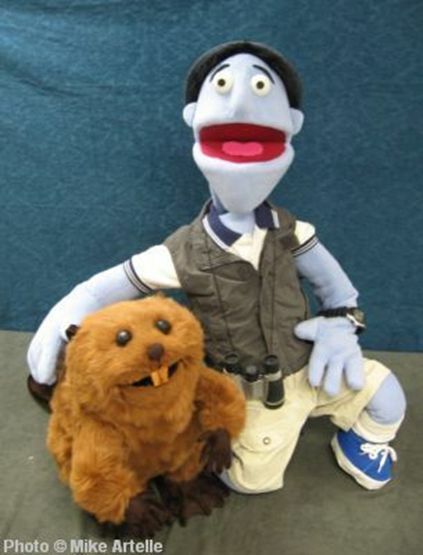 The other two puppets, a beaver and a birdwatcher, are shown below. 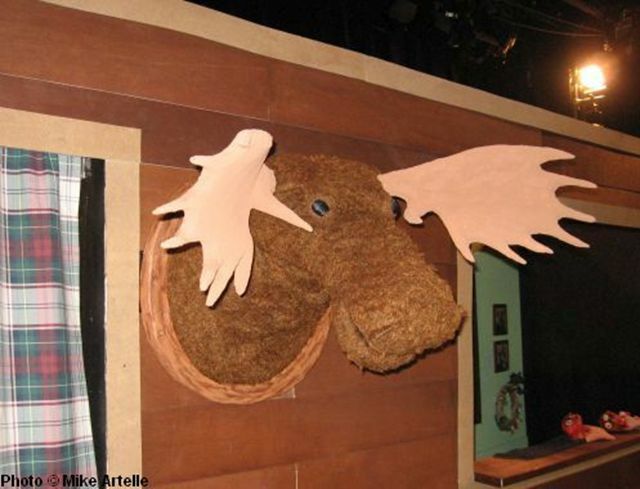 Sock N Buskin Theatre: Evil Dead the Musical In 2010 I created the Moose puppet for Sock N' Buskin theatre's production of Evil Dead the Musical. I had previously done Little Shop of Horrors for Sock N' Buskin back in 1999 (shown above). As with Little Shop I was once again impressed with the professionalism of the cast and crew from the production of Evil Dead the Musical. It was truly a remarkable show performed by a very talented cast of singers, actors and musicians. 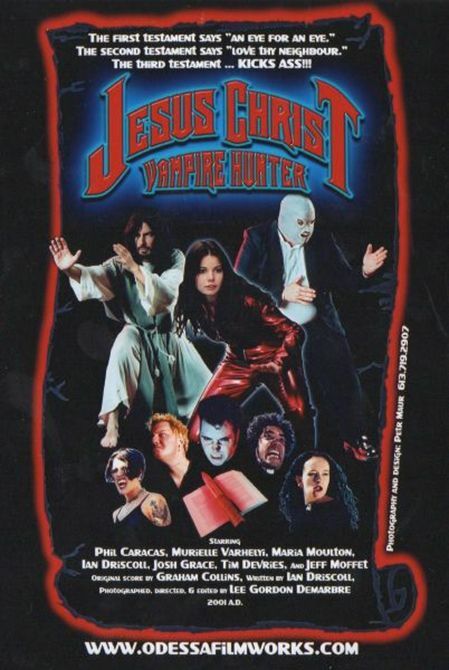 This specific production was the premier presentation of Evil Dead the Musical in Ottawa. While I was busy making the moose puppet, my mother Peggy made two Necronomicon books to be used as props in the show. One was giant sized and seen at the very beginning of the play, while the other was the regular sized one used throughout the show. I also made the chainsaw costume prop, as well as the "severed hand" puppet and prop. The latter are seen above on the ledge in the background. 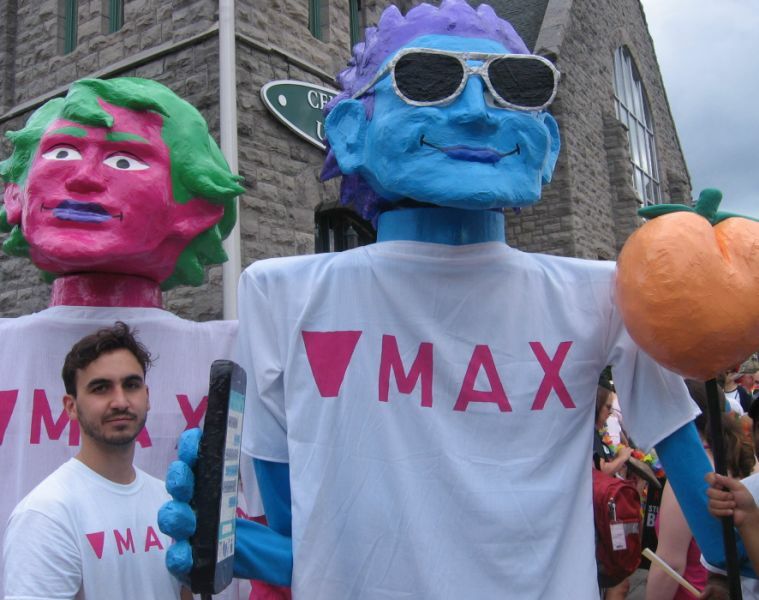 Here are the two giant puppets that I made for Max Ottawa with help from their awesome volunteers! Max Ottawa is a gay men's heath organization that I did some art workshops for over the summer. The puppets were built in July and Aug 2018 for the Pride Parade held on Sunday, August 26, 2018.